Locals joined bowling fans to enjoy the action of the Norwood Cup – sponsored by Bupa’s Norwood Care Home – at Shanks Bowling Club at the weekend – with an added twist. All available staff members of the Norwood Care Home took part in a group Ice Bucket Challenge to raise money for MacMillan Nurses. Many of the residents from Norwood Care Home, which neighbours the club, also had the chance to watch and cheer on the bowling and the charity challenge. Liz Campbell, Care Home Manager at Bupa’s Norwood Care Home, was thrilled with the success of the event. She said: “It’s been another fantastic event of bowls, entertainment and laughter – with the added attraction of the chance to raise money from the ice bucket challenge. “All of the staff at Norwood Care Home are definitely up for a challenge, so we were more than happy to take part and donate money to a worthy cause. 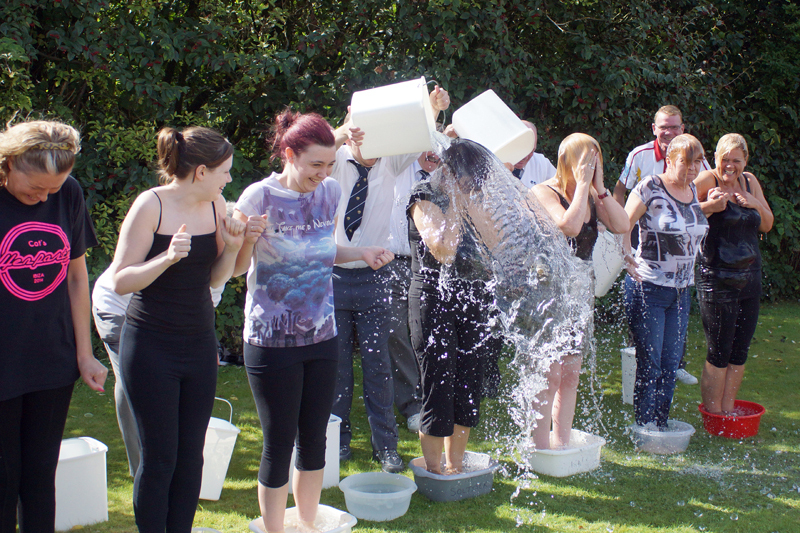 “It’s fair to say the visitors and residents had a great laugh watching us get soaked. As well as providing refreshments and hospitality at Shanks Bowling Club, Norwood Care Home donated the £250 cheque prize to Norwood Cup winner.